Rose-coloured glasses are wonderful things, and, like a double-edged sword, can be used both ways. A perfect example of this can be seen during the Automotive Dark Ages, when car companies tried their best to make their completely lacklustre econobeaters seem like more than they were. They way they did this was to use the power of nostalgia. The favourite trick back then was to use names of previously great cars to try and make the rust-prone, gutless and otherwise barely acceptable automotive offerings of the day seem like they were the offspring of those fabled progenitors. Thus, names like Mustang, Duster, Road Runner and Nova were applied to sad, drab, style-less boxes in an attempt to engender feelings of excitement and increase public desire for vehicles that, otherwise, would really not have generated much excitement on their own. Every car company was guilty of this to some degree, although the folks at the Chrysler Corporation were particularly guilty of this form of creative “associative marketing”. A perfect example was their use of the storied “Road Runner” and “Duster” nameplates. Only a scant decade earlier, these names had represented a family of fun, sporty and powerful cars that were the dreams of many. By the time the late 1970’s rolled around, though, there were no such cars in Chrysler’s stables. The era of the muscle car was long over by this time, with only the GM F-bodies to legitimately carry on the tradition. However, that didn’t stop the marketing department at the Offices of the Five Pointed Star from figuring out some way to try and harness some of the image attached the monikers. The question, of course, was “where to stick it”. What vehicle did Chrysler have that could carry the Road Runner name? There were a lot of bloated sedans and wagons, but that wasn’t the answer. No, the only solution was to stick the Road Runner label on Chrysler’s newest compact car, the Plymouth Volare. Given that the Volare was a none-too-exciting three-box economy car that could make little to no pretention to performance didn’t matter. Let’s face it, at that time, some gaudy, multi-coloured stripes and swooshy decals were all that mattered anyway, right? (Check out the Pinto Cruising Wagon for details!) So, with that in mind, the Road Runner and Duster returned. It wasn’t a spectacular return, but then again the Road Runner and Duster names had already been tarnished by its 1973-1975 use anyway. However, Chrysler did what it could, and there were stripes and special packages and all the “good(ish) stuff” that the struggling late 1970’s American Auto Industry could throw at them. Of course, that didn’t include much in the way of performance additions, but that was somewhat expected. By 1979, however, it seemed that the malaise of the era had caught up to the marketers, and even they were tired, beaten down and feeling the utter hopelessness of the Dark Ages. Thus, the last two years of the Volare-based Road Runner and Duster were little more than lip service to names that were already only being given lip service. They largely lacked the effort or care of even special striping or the false excitement of associative hype. They were just kind of there. If you bought a Road Runner, it had a “Road Runner” decal on it, and it had a spoiler. That was pretty much it. It was the dying gasp of a deeply cynical attempt to capitalize on better times; it was an end that was too long in the coming. Thankfully, this did not dissuade the model makers, most notably MPC, from continuing to crank out their “annual” kits. Unlike today, the model makers of Yore were particularly big on kitting the current models of many cars. Thus, you can conceivably model the entire evolution of specific car types. This was a practice somewhat derived from MPC and JoHan being the big Promo makers of their day. 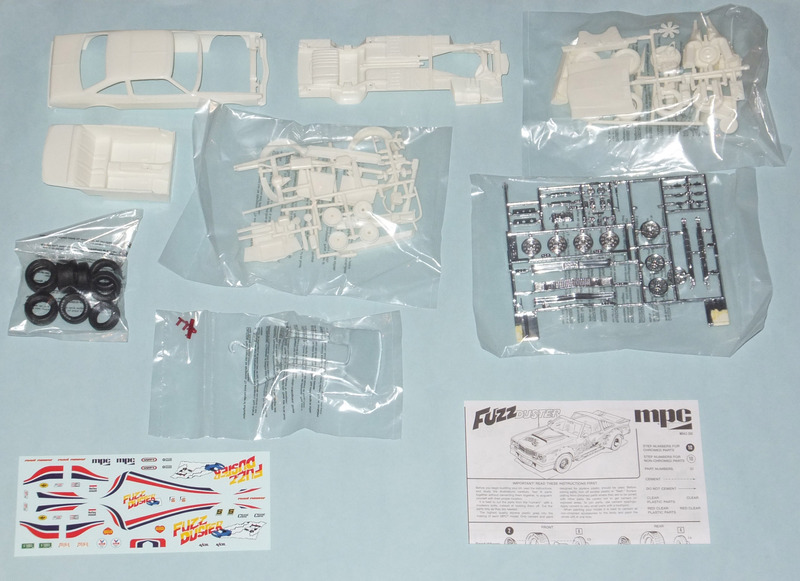 All I can say is “Thank your deity of choice” for this, because it means that there are a lot of cool kits of everyday cars that can be had. One such car that saw its evolution charted in styrene was the “Malaise Era” (that time also known as the Automotive Dark Ages) Road Runner. Even though Chrysler gave up on the Road Runner and Duster at the close of the ‘70s, that doesn’t mean MPC did, and they produced models of the ’79 and ’80 Volare Runners. If it’s one thing that MPC excelled at, it was reusing moulds. Once an “annual” could no longer be used or retooled to represent a current car (for example when there was a significant restyle), MPC would simply make the old mould into a wild custom, complete with ridiculous graphics and all the “cool” features of the day. Great examples of this are the amazingly large family of Ford and Dodge custom vans, the Bear Bait Chevette and of course the Pony Express Pinto. There were similar treatments pulled on Monzas, Omnis and Cavaliers, too. Thus, when the savagely enfeebled Road Runner met its whimpering end in 1980, it only made sense that it, too, would fall prey to the customizing department at MPC. The result was a typically overblown custom known as “Fuzz Duster”. This was a radically customized 1980 Volare Road Runner complete with flares, T-tops, fancy wheels and, of course, crazy striping. This particular model, thankfully, has been the target of Round 2’s efforts to restore and reissue. Now, instead of paying insane E-bay prices for one, it’s quite a simple matter to go down to your local shop, or online, and just order one for a reasonable price. So, let’s take a look at the long-sought after Fuzz Duster and see what all the hype is about! If you’ve read any of my other MPC car reviews, then you know I’m a sucker for good box art. You also know that MPC was a champion of awesome box art, and the Fuzz Duster is no slouch in this department! Right off the bat, your eyes are bludgeoned by an amazing array of colours, shapes and patterns. Front and centre on this box is, of course, the Fuzz Duster itself. This is no ordinary Road Runner, of course, and you can see that very clearly. The FD has MASSIVE wheel flares with rivet detail, more like what you’d now see on a Jeep or heavy pickup truck, that seem to be those of the Super Coupe taken to ridiculous extremes. What the…? MPC, will you PLEASE apply good taste to customs in the future? What, you won’t? Oh, well, okay. Clearly, Fuzz Duster is not classy or restrained in any way, except performance. There’s a lot more to the FD than just flares, though. There’s also a much-larger-than-regulation spoiler and a clearly glued-on hood scoop. Not to be forgotten is the front end: As if it wasn’t square and brick-like enough already, a large, relatively flat air dam adds extra drag while pointless fog lights add weight and reduce style even further. Add the weight of T-tops and massive side pipes, and you’ve got a vehicle that looks a lot thicker, wider and heavier than a normal Road Runner. Of course, it’s not an MPC custom if you don’t get some serious decal action going on, and man, FD has it in spades! There are red and blue stripes that careen all over this thing, but that’s not enough. No, not even close. Just like Bear Bait had the cartoon car outrunning cop car, so too does Fuzz Duster. I mean, you can tell they’re kindred spirits, so it only makes sense to really just go all out with it like this. If I was a cop and I saw a vehicle like this, I would totally ignore it. I mean, how sad do you have to be to have a picture of your car leaving a cruiser in the dust? It’s like those ‘90s baseball caps with the fake metal plate on them that says “Bad Boy”. Yeah, that skinny white kid in Grade 9 is definitely so bad he has to advertise it with a lid from the Good Will. Fuzz Duster is just as thoughtless and tasteless as that. Of course, that’s what makes it great! Right. Police love that, when you make fun of them ON your car. I can’t see this guy getting pulled over at all, can you? There are an interesting couple of changes to the box, too. On the front, instead of the white space in the top left corner advertising the Golden Wheels campaign, the new box has a very clear enticement; a yellow secondary box announcing that this kit is a 2-in-1, and that it can be build stock or custom! That puts that worry to rest. Most MPCs of this era can be built both ways, but that’s not always a safe assumption, so it’s great to know you can get a total loser out of this, well, total loser! The sides of the box show you some awesome original photos of both the stock and custom versions. There’s a great addition showing the new expanded decal sheet, something of interest to many (since MPC’s decals don’t work well when older) and a note about new pad-printed tires. This is AWESOME! They are like those on the sweatiest of man-horses, the Pony Express itself! This means that, should you choose to use the conventional tires, you will be rewarded with some awesome rubber. “Classy”? You call this “classy?” How high were they at MPC? The addition of pad printed tires, though, does make up for it! Uh, no. That’s not a V6. That’s a mighty 318, which actually makes this worse. So, how does the FD hold up as a kit? Well, like nearly every other Round 2 kit of recent times (save Pony Express), it is moulded in white. This is good, but frustrating for photographic purposes. Still, there are a couple bags of white racks and a separate bag with the body, chassis and interior in it. The windows are, I’m pleased to report, bagged separately, so as to minimize damage, and the tires are also bagged separately. I’m glad of this, as it prevents the dreaded “MPC Tire Melt”, but it does take the “Russian roulette” thrill out of opening an MPC box. In the “good old days” you could almost take bets on how bad the windows would be! Here’s what you get. Quite a bit, and no tire melt to be seen anywhere! In addition to the above-mentioned parts, there’s also a rack of largely-inappropriately chromed engine pieces, and this chrome rack also has the two kinds of wheels and the bumper/grille assemblies. Oh, and the side pipes; don’t forget the side pipes! They actually look pretty awesome, and for a custom they will be very nice additions. I still lean towards white for them, but that’s likely my inner Vanner talking. 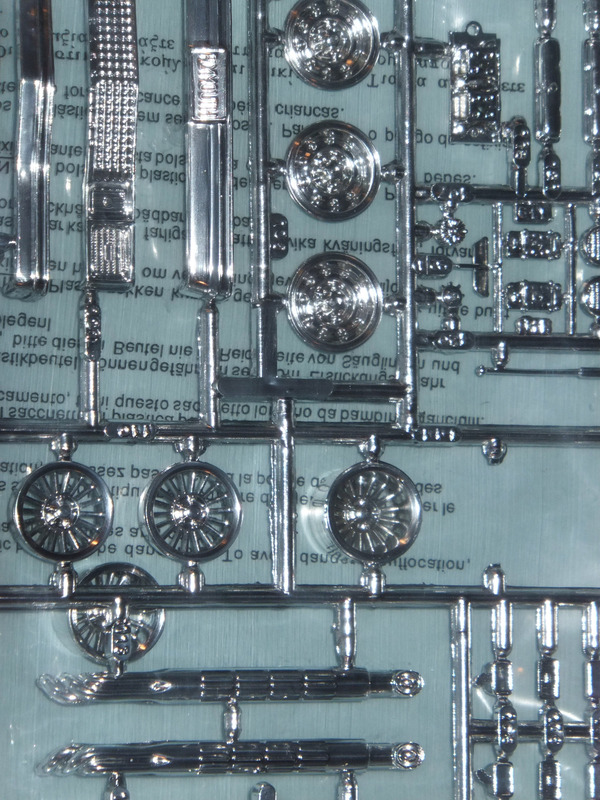 Here you can see both styles of wheels on the chrome rack. Nice pipes, too! The moulding on the car looks good. It is definitely a Volare, there’s no question about that. The general shape looks good and the kit captures the one-year only grille treatment perfectly. For Road Runners, the grille and headlight surrounds are flat black, so keep that in mind; you might have to strip the chrome and repaint it with Alclad if you’re going to get this effectively mimicked. The seats and interior look really nice too, with deep crevices that are going to look great with a tiny bit of washing/shading. The carpet in the interior is not quite what I expected, though. Normally, MPCs have a very aggressive nap to them, but this one is much looser, and a bit crisscrossed. It almost looks like diamond plate, but not quite. The interior is nice, but not as good as later MPC kits, at least carpet-wise. The chassis detail is alright, but the rear subframes, part of the front suspension and, oddly, even the drive shaft are moulded in. 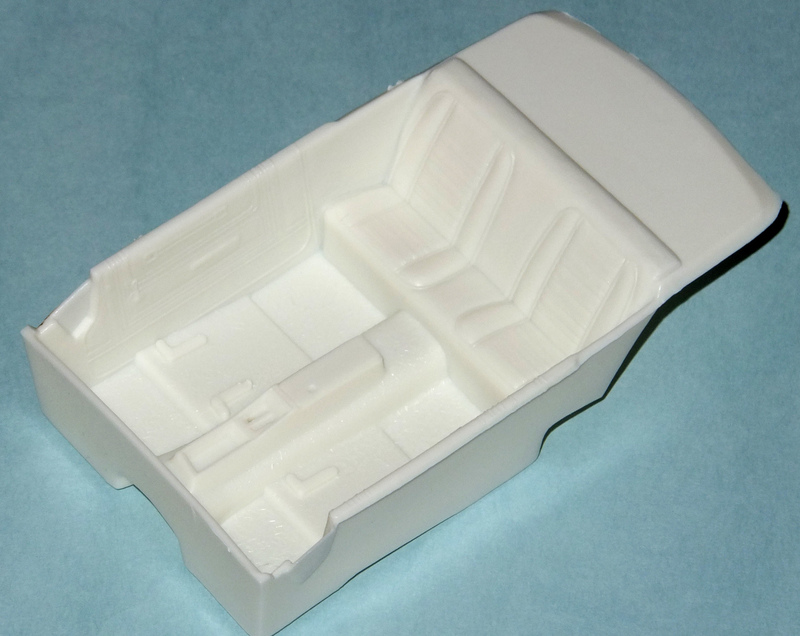 There’s a bit of texturing, and what could be a brake line also moulded in, but not much else. It’s not the strongest chassis I’ve seen from MPC. On that same note, the engine is passable, but it’s not as good as the four-bangers we’ve seen before. The engines on the Omni/Daytona family, as well as the EXP and Cavalier are all better than this one. There aren’t all that many separate accessories on the 318, so that is a bit of a disappointment. There’s a stock single-carb intake with a typically dorky air cleaner, as well as a custom two-carb setup that includes a new intake manifold, two carb-shapes and two domed, chromed intake grilles. Still, it’s miles better than anything Monogram and Revell had to offer at the time! It’s odd to me that they’d mould the drive shaft in. The chassis is simple, but good otherwise. The engine bay is good, though; far better than the ’75 Vette convertible. There is a battery, some bottles, a rad hose and even a master cylinder! There’s some vague wiring detail on the wheel wells, which are moulded into the chassis, so that’s a come-up as well. The exhaust system is moulded separately, although all as one piece, so painting it will be miles easier than the driveshaft! There are T-tops moulded into the roof, and they’re designed to look like they’re T-tops that are secured in place. This means there are mouldings around them, to simulate drip/edge rails, and they are also “scored” on the underside, so if you want to remove them, you can. If you want to make a hard roof, you’ll have to sand these mouldings down. I would also suggest backfilling the “score marks” with melted plastic or reinforce the roof if you do this; I don’t know if there’s much spare material otherwise, and you could go through the roof! That’s great if you’re doing a junker, but not so much on an “as new” car! Here’s how the T-roofs look from the inside. You can see the cut lines clearly. If you choose the T-roofs, you’ll also have to do some surgery on the windows. The front and rear windows are joined by a pair of “bars” and these will have to be cut out. Then, the roof surgery has to be done, and there’s a new central bar that fits in to create the “T” in the T-roof. I have no idea how this will fit; I’m tempted to try it, but MPCs aren’t known for their precision when it comes to things like this! Check out the Bad Company glass roof panel, like the one I used on Gold Rush, and you’ll see what I mean! 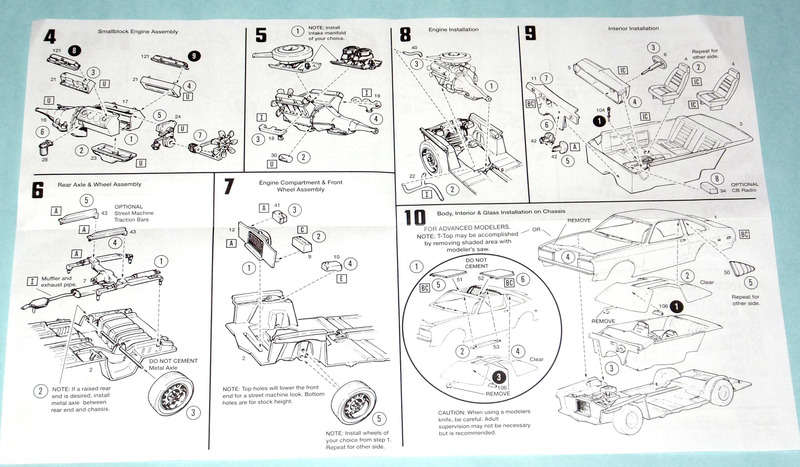 The instructions are just like every other MPC kit you’ve ever built, assuming you’ve built some of them before. They are simple, clear and well-drawn, and there are helpful notes throughout. They are the smaller-sized instructions, too (unlike some that come with a tablecloth for an assembly manual), so keeping them near the modelling table shouldn’t prove a problem. There’s a list of colours, but they don’t call out specific brands. That’s fine, though, then you don’t have to worry about crossing colours. Just look up the colour you want on the internet, and base it on what you use! There’s nothing confusing about the instructions at all, and a novice could follow them completely without issue. This is the first half of the instructions. You can see the colour callouts on the left side (the end of the instructions, technically). Here’s the meat of the assembly work. Nothing too complicated. Check the engine bay accessories! The decal sheet is an amazing piece of kit, though. All the Fuzz Duster decals and striping are gaudily and faithfully reproduced, and they should work fine, since they’re all brand new! Add to these decals a lot of racing credits and some licence plates, and you’ve got some good stuff to go in the spares box when you’re done. There are even three appropriate “Road Runner” decals, one for each door/fender and one for the spoiler, if you’re building stock. If you want custom craziness, then this sheet is for you! The only problem is that these are in red. That means you can’t use them on a brown or green car. You can have your stock Road Runner, then, in red, black, white or maybe silver (never seen one like that in silver, mind you), but that’s it. It’s a shame, because the Brown with tan interior really calls out to me. One thing that you DON’T get on the decal sheet is the striping that goes around the windows, fender arches and spoiler on the real, stock car. I know that’s a lot to ask, especially in what is essentially a post-year-of-the-car-in-question annual custom kit. It’s like how Wild Breed doesn’t have any conventional decals with it. I’m Confused. What IS this thing again? There are no bumper guards on any of the bumpers. While I can’t prove they’re standard (the literature I’ve read doesn’t call them out), they seem to be on nearly every Volare and Road Runner I’ve seen from ’80. We can let this go, though, in general, I think. A seemingly nice feature is the rear side window louvres. These are definitely common on late ‘70s Road Runners, but it’s extremely rare to see them on the ’80. Would they fit? Heck yeah; it’s the same window! Would people order them from dealers/ J.C. Whitney and put them in. Most likely. Are they legit? Hmmm… I would say no. I can’t find any literature that shows them, and almost all ‘80 Road Runners seem to be without them. The wheels are wrong. In 1980, you got painted 8-spoke road wheels with the Road Runner. You can see these once in a while on internet photos, and there’s a beautiful example on a “for sale” site that has these wheels/trim rings. The stock wheels that come with the FD are more like the road wheels from ‘Cudas and other earlier ‘70s Mopar cars. With some paint, you might trick someone into believing the kit parts are legit, but they’re not. The seats seem to be wrong. Yes, you can get buckets in the ’80 Road Runner. Looking at the catalog and the few pics online, though, leads me to the conclusion that the seats in FD are not correct. They are too cushioned. The sales book specifically states that the Road Runner has the vinyl buckets WITHOUT the cushions. (Sounds like typical Chrysler, eh?) Again, the seats look great, but they aren’t spot on. The door panels seem off. While it’s hard to see in the photos, the door panels have a pull strap near the top. The few interior shots of ’80 Road Runners I’ve seen don’t have these. Sounds minor, and it is, but it points to the fact that not all is quite what it seems. The tail lights are a bit off. They are cast in clear red, which seems good, until you realize that there is a backup light that has to be painted in there. No biggie, though; cover the whole thing in Bare Metal Foil and then just paint clear red over the red parts. You’ll get your trim done at the same time! However, the problem is the proportioning. The lights are divided into two flanking sections and a larger centre one. This is nominally correct, but the sizes of the three sections are way off. The outer parts are too big, and the inner part is not big enough in relation to it. I think that these problems stem from the fact that, deep down, Fuzz Duster is an annual. This means MPC did the best they could to make maximum re-use of the moulds they had, and only change what they had to, or really knew to. This is a problem today for those interested in absolute accuracy, sure, but at least it did mean we got a kit of the ’80 Road Runner; it’s the price we pay! When it comes to making the most out of an annual kit, no one outdid MPC. With a customizing department that was high on all the Car Craft-iness they could get their hands on, you were assured that even last year’s model would come out with some crazy bolt-ons and decals for years to come! 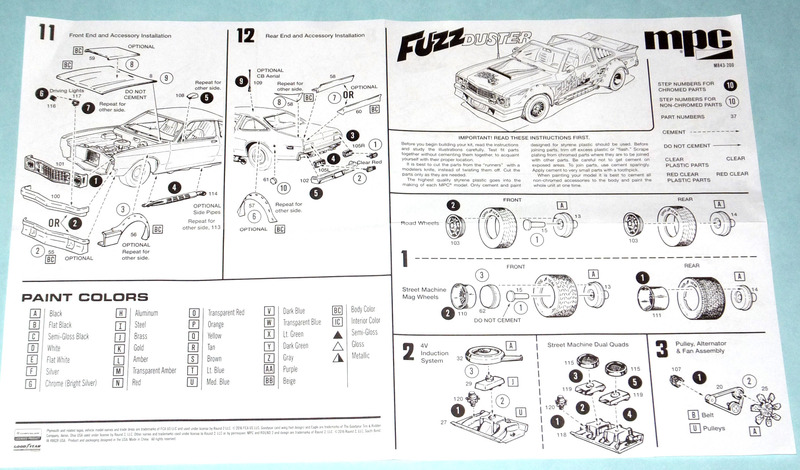 There were several models born of this approach, and Fuzz Duster is certainly one of them! They’re way overdone, sure, but that doesn’t mean that they aren’t fun in their own right. Even better, many of them can be built completely stock, and that is a real boon for fans of the everyday cars like myself. Regardless of whether you build them as “losers” or “cruisers”, there’s lots of good things you can say about MPC’s late ‘70s and early ‘80s kit lineup. 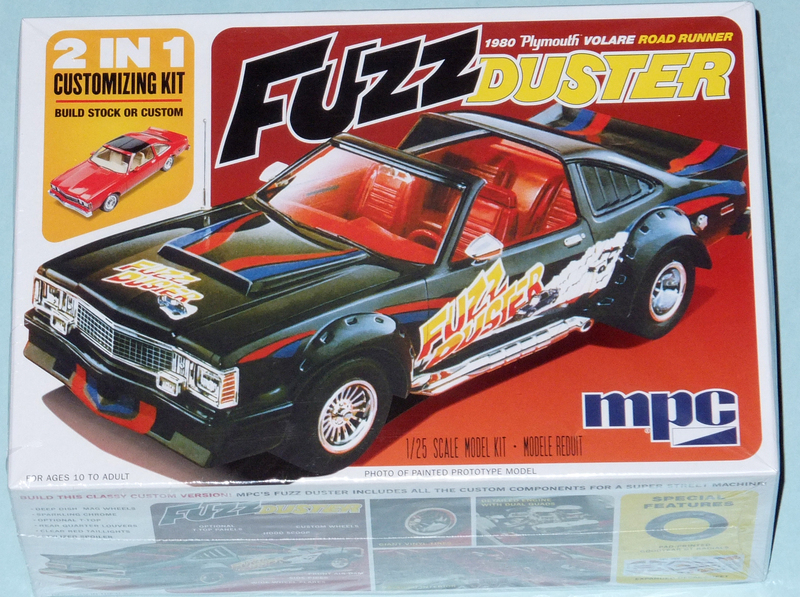 Fuzz Duster is a perfect example of this: a kit of a car so bad that no one cared at the time, but now one that everyone wants due to nostalgia. Even rose-coloured glasses aside, the Fuzz Duster is a good kit, but the retro-ness really does add to the fun! I wouldn’t suggest this as a first kit for an inexperienced builder, but it would make for a fun learning experience if you want to build one with a less experienced hobbyist. That’s a great strength of MPCs; they’re awesome for trainers! There are a lot of good details if you want to use them/practice on them, and you’re still going to be okay if you don’t make full use of them. The fit won’t be perfect, so sanding sticks and elbow grease are going to be needed to get Fuzz Duster together, and that’s good practice too. I am totally enamoured with this kit, and even though it’s not quite what it purports to be, I can’t help but love it anyway. I would definitely recommend this one for any fan of Malaise Motoring, and those who love to build something a bit on the loser or obscure side. Man, it’s like it was MADE for me, eh?